The 2015 Toyota Avalon, currently available in hybrid and non-hybrid configurations, is now in its fourth-generation iteration. I recently was loaned one of them by Rocky Mountain Redline, and the car delivered was painted Celestial Silver metallic and featured premium black leather seating. With all Avalon production taking place in Georgetown, Kentucky, the first unit rolled off of that assembly line eleven years ago as a 1995 model. They are full-size, front-wheel drive sedans and represent Toyota’s biggest such offering. At my age (the Beatles hit U. S. shores while I was in high school), the Avalon represented a nice car to be seen in, and drive around in, for the period of my evaluation. The ride on its 111″ wheelbase is superb do to the MacPherson strut front suspension with offset coil springs and stabilizer bar and dual-link independent MacPherson strut rear suspension with offset coil springs and another stabilizer bar. The room inside is ample for big, American motorists with 0ver 42″ of legroom is up front and over 39″ in the back seat area. The same holds true for shoulder room in the car at nearly five feet of it, front and rear. Overall length is 195.3″, six inches shorter than a Chevrolet Impala and 4.8″ longer than a Mazda 6. The Avalon weighs 3,638 lbs., the same as the Chevy despite the fact it has a big hybrid battery on board. The efficient power supply for the Avalon consisted of a 2.5 liter, 4 cylinder hybrid gas/electric engine with 200 hybrid system net horsepower (149 kW) and an electronically-controlled continuously variable (CVT) transmission. 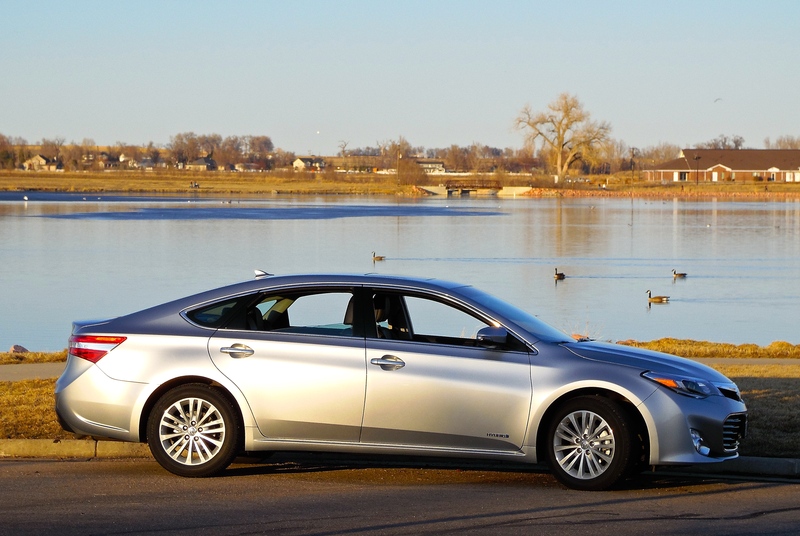 The EPA estimates for the Avalon is 40 mpg – combined and city. Highway mileage rating is 39 mpg – my experience for the week driving the car was 38.9 mpg. The fuel tank holds 17 gallons of regular unleaded gasoline. It’s impossible for the Avalon styling to offend anyone, young or old. There exists up front the Toyota-specific big chrome mustache grill with black background, high intensity discharge (HID) quadrabeam headlights with auto on/off feature, and LED daytime running lights (DRL) with on/off feature. The fifteen-spoke painted aluminum alloy wheels are fitted with P215/55R17 Bridgestone Turanza EL400 mud and snow radials. No tailpipes are visible at the rear of the car (hybrid-style), but ample chrome is and a spoiler is almost molded into the trunk lid where underneath there is 14 cubic feet of cargo space available to the five passengers. 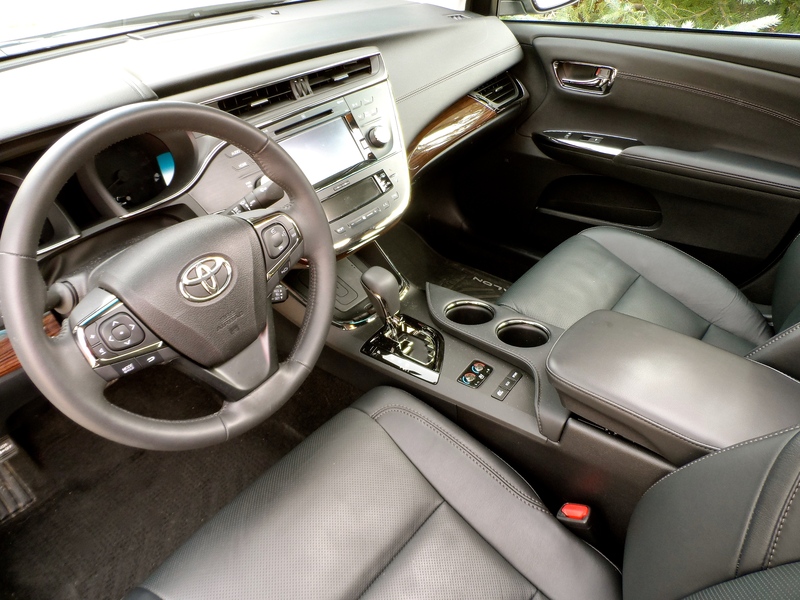 As you might expect, the inside the Avalon Hybrid Limited is sumptuous with its premium perforated leather-trimmed multi-stage heated and ventilated front seats, 10-way power-adjustable driver’s seat with power lumbar support and power cushion extension, and 8-way power-adjustable front passenger seat. On hand are premium JBL stereo, navigation system, 7″ touchscreen, Bluetooth connectivity, power rear window sunshade, ten airbags, tilt/telescope, pushbutton starter, backup camera, smoked chrome accents, and power mirrors/windows/locks. M.S.R.P. of the Avalon tester came in at $44,475.00, including $825.00 for freight and $1,950.00 for the technology package which included radar cruise control, automatic high beam, pre-collision safety system, and wireless charging platform for smartphones. It’s a considerable investment, but a sound one given the comfort, beauty, and economy that the buyer gets in the bargain.